This bit of news got me really excited about the new business partnerships that are developing around a renewable energy economy. 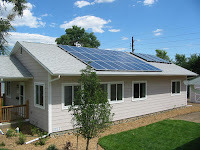 Verde Energy is an Austin Texas-based company that brokers renewable energy systems. They've teamed up with banking giant Wells Fargo - the top purchaser of green power in the U.S. - to help customers finance the purchase and installation of renewable energy products. Verde ("green" in Spanish) is a brand new company, launched last August. Verde helps customers determine whether it makes sense to install renewable energy and can also provide bids from local energy contractors for installation. Most of its business is done with homeowners, although they also do some work with commercial property developers and owners. Wells Fargo will provide the "competitive" loan rates for renewable energy projects. The banking giant is currently the #1 purchaser of green power in the United States. Verde CEO Rob Powell says the partnership with Wells Fargo could help open doors for customers who otherwise couldn't afford to finance clean energy projects. "Many of our customers indicate an interest in financing options for their project yet have a difficult time finding lenders who are familiar with renewable energy systems...We've partnered with Wells Fargo because they have a real interest in renewable energy and, most importantly, are providing competitive rates for these projects." I hope we see more partnerships between banks and renewable energy installers, which will provide greater access and opportunities for people to choose renewable energy. Homeowners should have the option to build systems like these directly into the cost of their mortgage, making it even easier to create an efficient and clean energy system for themselves.